Info here is covered in / superseded by the FAQ, and may no longer be valid. It is provided only for historical interest. redesign was still in progress. !!! NEW SITE RECORD: 57,296 VISITORS ON MAY 15 !!! Buy "Lateralus" at CDNow, if you somehow still haven't. "... it is by far the WORST documentary I have ever seen on any band. It is clearly obvious that this tick of a company is trying to leech a few bucks off of our favorite band ... 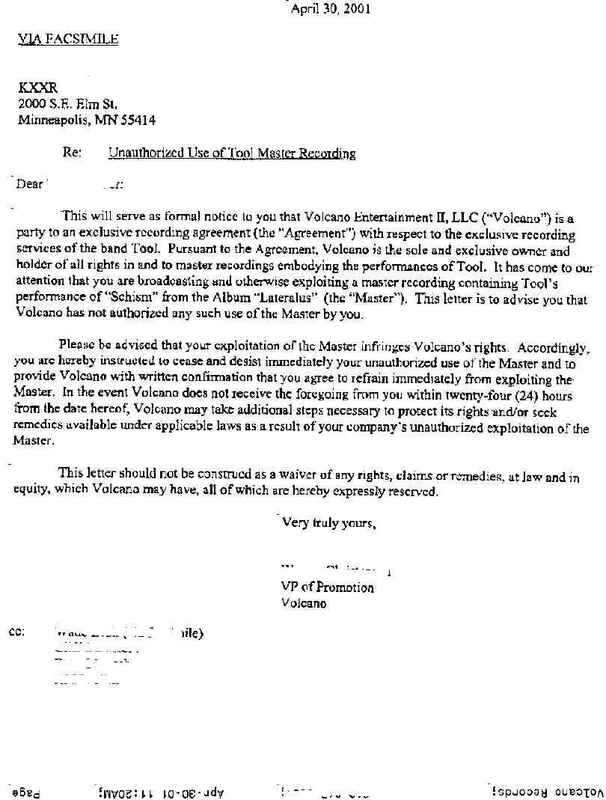 Unfortunately, it seems they have covered themselves legally by not using ANY music by Tool or using ANY live performances. Instead, it re-uses pictures taken at a concert over and over again, excerpts of an interview with Adam that some lucky fool was able to acquire, and at least twenty minutes of these college radio kids talking about Tool like they have a clue about what the band is about. The music is GOD AWFUL as well, and poorly represents the band. If someone who didn't know about Tool watched this, I fear that they'd never give the band a chance, it's that horrible!" Did you have any doubts? "Lateralus" debuted at #1 this week, becoming the first Tool album to do so ("Ænima" hit #2 in its first week, behind only Nirvana's live album). According to Billboard, the new album sold over 300,000 copies more than Missy Elliott, this week's #2 entry on the charts. Official results will be posted soon, but this looks to mean that "Lateralus" has gone gold in the US (500,000 copies, platinum is one million). [05/17/01] - Kabir on vacation and radio | Dead-ssectional? Even though there were a lot of people who didn't get tickets yesterday (some who say they were first in line), seems a lot of wily Tool fans were able to get themselves admission to the Atlanta show. There was a common thread to their stories; many were in line at the box office, and many tried out-of-state Ticketmasters. Several of those folks recommend not trying to buy online on the day tickets first go on sale; I can attest to that - fellow Tool netizen Tyrone Thompson and myself both got the Ticketmaster.com shaft when trying to buy tickets for a NIN / APC show last summer. [05/02/01] - They'll gorge ya in Georgia | Vinyl pre-orders | Tuning in | MTVCR alert | Getting "labelled"